"I knew I had to let go of one of them and I just thought I’d better let go of the one that’s the oldest," said Searle, who had then held on to two-year-old Blake in the Thai resort island of Phuket. "And I was screaming, trying to find him, and we thought he was dead." I wonder how many similar incidents, among survivors and the now 125,000 dead (can you comprehend the magnitude of that? ), did not turn out so well. I received an email from my cousin George, still on the scene in Phuket. Ok, here’s the scoop. All is not well. The coastal areas are smashed, including our little ton sai beach. Beth & Annie were in hammocks at Freedom bar and I was 200 yards down the beach warming up on an easy climb. The tide was at max high, so we had to skip around to climb, if ya know what I mean (all you beach climbers!). Then we noticed that the waterline was dropping FAST; we looked out to sea, and saw a huge wave coming. Everyone stared open mouthed and then ran like heck. I made it to a ladder and made it up. I was frantic about Beth and Annie but could do nothing except watch the waves hit Freedom Bar. They made it up the hill fine; I found out later. Then I went down the ladder in a daze; I don’t remember much except picking up a little dog, when the next, and biggest one hit. I ran for my life, and made it! That’s all there is. We helped with the cleanup and now wait to see what happens. I’ve not much to say about the horrific disaster in southeast Asia. It’s all been said. What makes it real for me is that I’ve been to a lot of those places. I spent months in Thailand in the late 80’s and have vacationed in Phuket twice (note to media talking heads: it’s pronounced “p-hoo-ket,” not “fooket”). I’ve sunbathed and swam the waters of Patong Beach. I was even there over a Christmas holiday, 1990. I once enjoyed a delightful stay of a few days in Penang, Malaysia. Passed through Bangladesh a couple of times. Not so great, that. Spent several days in Jakarta, Indonesia in about 1988. It’s on Java, not Sumatra, but you get some sense of the country and its people. While transiting the The Malacca Straits by ship between Singapore, Malaysia, and Indonesia, I recall standing on the bridge wing watching the eastern coastline of the enormous jungle island of Sumatra go slowly by. Later, on our way to the Persian Gulf, we stopped briefly in Sri Lanka to refuel. It also turns out that a cousin of mine, an expert rock climber and mountaineer, with whom I just visited two weeks ago at our Christmas party, was scaling a rock cliff on or near Phuket when the tsunami hit. We have word that he and his companions escaped unhurt. Thank God for that. But then, who could possibly believe in a literal, “intelligent” God after something like this? This, this is real and there’s not a fantasy man can conjure up in his head that makes this particular reality one less bit rotten than it is. But God does exist, nonetheless. Do you know where? He exists in the form of "stingy" Americans and Europeans now gladly donating to the tune of many millions of dollars (apart from what governments are doing). He exists in the form of the thousands of patriots and ex-patriots on the scene in each of those countries lending a hand–to both dignify the dead and aid the survivors. God is much closer than we think. 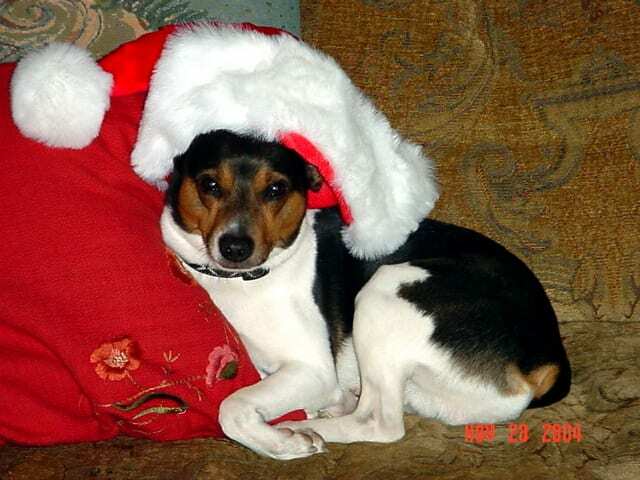 Here’s the photo on the Christmas card my wife sent out this year (to those who know Rotor, anyway). So, Rotor (and Beatrice and I) wish you and yours a Merry Christmas and a Happy New year. I also offer you a sincere hope that you endeavor to make of 2005 something more than you made of 2004, along with a wish for the prosperity on all levels that’s sure to follow. That’s right, it’s Christmas, not "Xmas" and all that other rot. If you’re telling people "Happy Holidays" because you’re embarrassed to say "Merry Christmas," or paralyzed by over-sensitivity, just get over it and let yourself go. Trust me. You’ll feel much better. Go. With. Christmas. Christmas is such an event in Western Civilization because it’s a recognition and celebration of a set of core values and beliefs at the very root of this great civilization, whether Christ is to you a literal being, or to me a great metaphor. An atheist, such as myself, who can’t appreciate the splendor* of Christmas and all that it represents (religiously, commercially, and all that) is just hopelessly materialist to the point were we are left to wonder how these people manage to care about anything. If you can’t care about Christmas, for Christ’s sake, what on Earth can you care about? I just hope Kim is right about all this misdirected energy swinging the other way.